Rare Snowfall Blankets Dunes in The Sahara : The Two-Way An amateur photographer in Algeria captured beautiful images of a rare phenomenon this week: the red and white swirl of snow dusting sand dunes in the Sahara. Snow fell in and around the town of Ain Sefra, Algeria, on Monday. 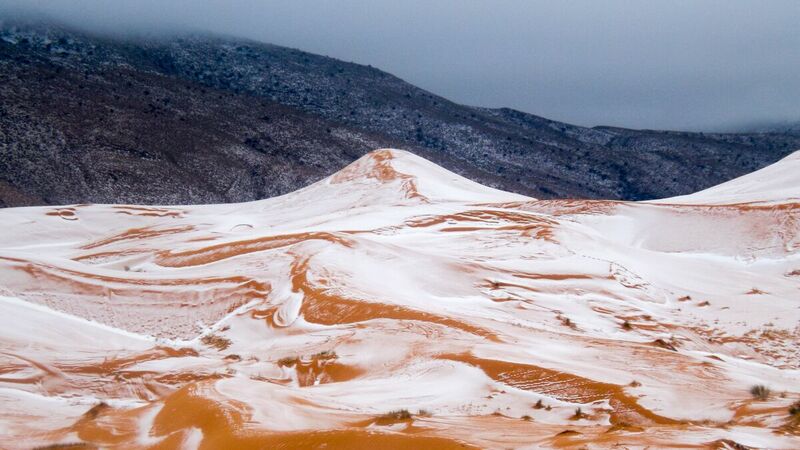 On Monday, a rare and beautiful thing happened: There was a dusting of snow on the red sand dunes of the Sahara. The snow fell on the northern Algerian town of Ain Sefra, which is known as the "gateway to the desert." Karim Bouchetata, an amateur photographer there, grabbed his camera and took a number of photos before the snow melted later that day. He uploaded them to Facebook, where the surreal images quickly went viral. "Everyone was stunned to see snow falling in the desert; it is such a rare occurrence," Bouchetata told The Telegraph. According to Gizmodo, the last "major" snowfall in Ain Sefra was in February 1979, when it snowed for all of half an hour. The town lies about 1,000 meters (just under 3,300 feet) above sea level near the Atlas Mountains. "The snow fell in a region where summertime temperatures average 37°Celsius (99°Fahrenheit), though wintertime temperatures have been known to get down into the single digits Celsius (30s Fahrenheit). Such moisture is as rare as the cool temperatures, given that just a few centimeters (inches) of precipitation fall here in an entire year."